Caution: Tickets are not always issued with some English. Note: Passengers with this ticket should proceed to "Non-reserved Car", and cannot sit or stand in "Reserved Car". 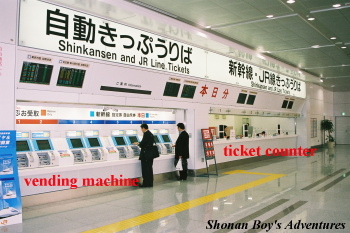 You should buy tickets at the ticket office, and can also buy with ticket vending machine. With vending machine, passengers can buy fare ticket and super express ticket which are the same portion. If you have any rail passes which include super express charge (such as Japan Rail Pass), you cannot buy ticket with vending machine (Buy at the ticket office). If you change trains from present line to Shinkansen without super express ticket, you can buy ticket counter by Shinkansen transfer gate. Photo: Passengers who ride a wheel chair can also buy tickets easily because these vending machines are situated at low place.